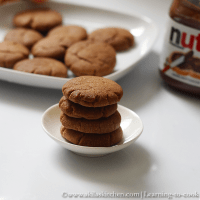 Eggless Nutella cookies is such an easy and kids friendly snack without egg. These are soft as well as chewy with full of chocolaty taste. Eggless nutella cookies recipe with easy step by step instructions for your easy understanding and learning. 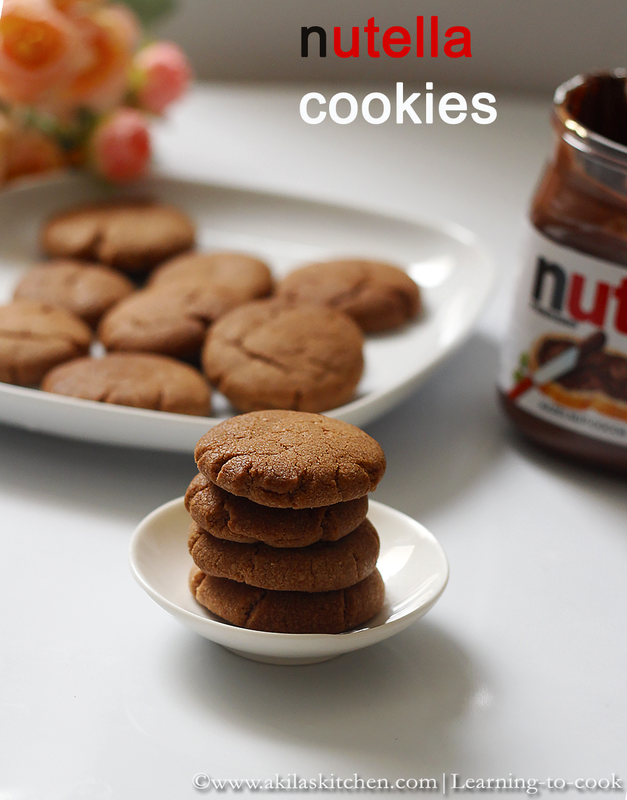 Eggless Nutella Cookies are crunchy and tasty cookies, which I used to prepare normally, when there is more or left over nutella in my home. Since the cookies, contains nutella, my kids love them so much and never say no to these cookies. They like to eat the Nutella cookies, when they are still hot. Lets see the recipe. You may also check the other Eggless cookies, if you like. 1. Preheat the oven to 175 deg C. Take a bow, and add the butter, sugar and Nutella. Beat in low speed level 1 until it is well mixed and they could form spikes. 2. Mix the flour, baking powder, baking soda, and salt and sift well. Now add these into the Nutella butter mixture. 3. Again beat them slowly and add the vanilla essence. Mix them again till it forms a pliable dough. Now take small portion of these and flatten it using your palm. Line them in baking sheet. 4. Keep in the oven for 20 to 25 min or until you can see them leaving cracks on them or till they become light brown colour. Cool them and serve. 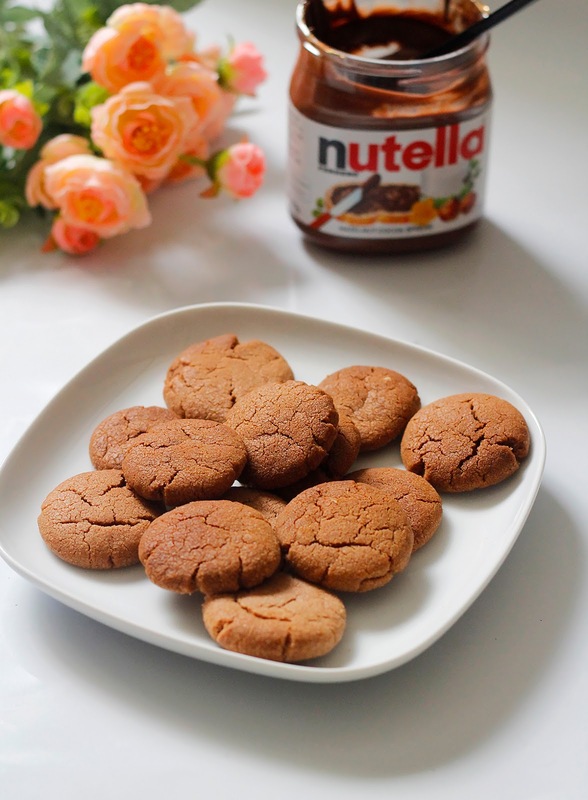 Eggless Nutella Cookies are crunchy and tasty cookies, which I used to prepare normally, when there is more or left over nutella in my home. Since the cookies, contains nutella, my kids love them so much and never say no to these cookies. They like to eat the Nutella cookies, when they are still hot. Preheat the oven to 175 deg C. Take a bow, and add the butter, sugar and Nutella. Beat in low speed level 1 until it is well mixed and they could form spikes. Mix the flour, baking powder, baking soda, and salt and sift well. Now add these into the Nutella butter mixture. Again beat them slowly and add the vanilla essence. Mix them again till it forms a pliable dough. Now take small portion of these and flatten it using your palm. Line them in baking sheet. Keep in the oven for 20 to 25 min or until you can see them leaving cracks on them or till they become light brown colour. Cool them and serve. *Post first published on March 5 2014. Updated with recipe. 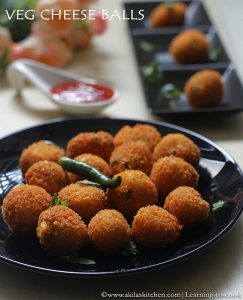 Simple recipe.. definitely a kid's delight..
Looks fabulous and seem easy to make. Will try esp during festive seasons or when I can breathe away from work. Love nutella in any form. A must try cookie. Coolies looks crisp and tasty……… Nice click! !